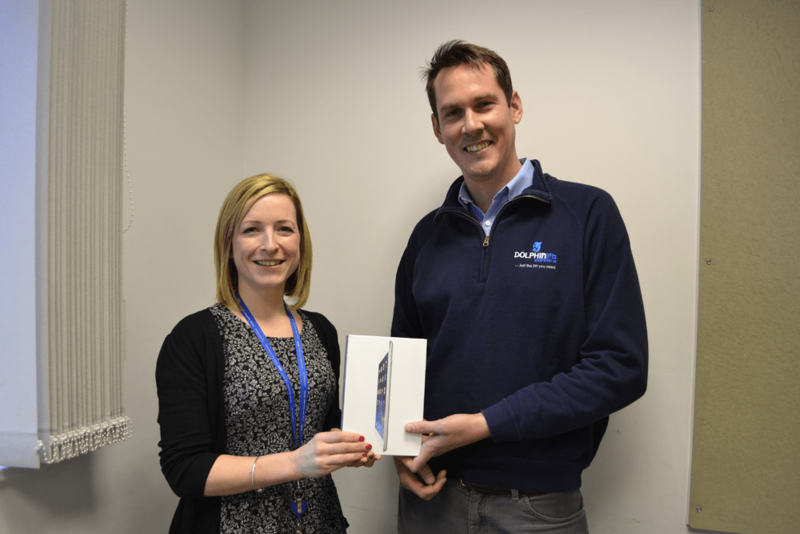 Following the recent OT Show, Dolphin Lifts met up with one lucky show visitor who won its iPad competition. The winner was Liz Rollinson, an Occupational Therapist with Gloucestershire Care Services NHS Trust. Liz was presented with her prize by Tom Wakefield of Dolphin Lifts Western, the Dolphin franchise responsible for the Gloucester area. Liz has worked with the team at Dolphin over a number of years. It was the presence on the stand of the Handi-Move Body Support System, which enables the end user to self hoist with a Handi-Move ceiling track hoist that caught her attention – and resulted in her winning the iPad. “I was keen to learn more about self hoisting and the information I received from Dolphin, coupled with winning the prize draw, made it a very worthwhile day!” commented Liz. The event was a great success for Dolphin Mobility as Managing Director Craig Dunnage explained. “Exhibiting at The OT Show provided us with a fantastic opportunity to engage with OTs and showcase hoists and stairlifts from some of the UK’s leading manufacturers. We will certainly be exhibiting again”. Dolphin Mobility is always looking for events at which it can demonstrate the unique Hand-Move Body Support System and other products from its portfolio to OTs such as team meetings, open days and CPD events. Please contact the team on 0800 9800126 for more information and to arrange a visit. The Dolphin Lifts Group prides itself on being independent and represents many of the leading mobility and access equipment manufacturers, including Handi-Move, Liko, Stannah and Thyssen. Over the last 25 years, Dolphin Mobility has firmly established itself as a leading independent supplier of hoists and stairlifts in the UK. There are now 16 independently owned and operated Dolphin branches covering the UK and many of these are family run businesses, which helps to add the personal touch so often missing from larger companies. However, as it is not aligned with one individual supplier, the company is in the unique position of being able to offer customers independent, impartial advice and quotations. For more information and to find your nearest Dolphin Mobility branch visit www.dolphinlifts.co.uk or call 0800 9800126. Our fabulous OT wall planner has now launched!